Welcome to Recycling Rules! We are a 501(c)(3) nonprofit organization dedicated to helping you start or enhance a recycling program. 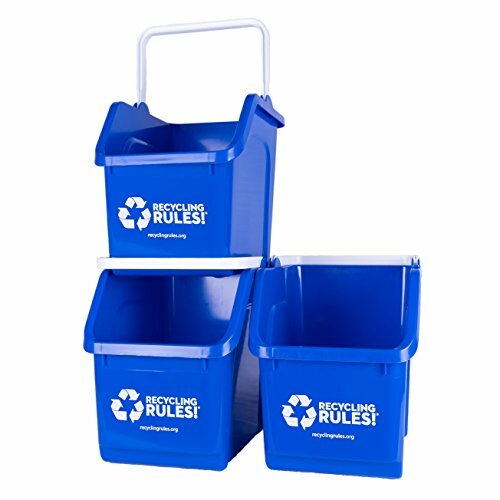 This recycling bin is a customer favorite and is our best-selling bin. It's perfect for collecting recyclables in a kitchen and fits nicely under most sinks, in a utility room, a garage or by a desk. When full its sturdy handle makes it easy to carry to a central recycling dumpster or to take to your recycling center. Many apt. and condo residents find this bin a must. Great for schools, offices, and churches too! Its nontraditional shape helps keep trash out and recycling in. Watch your recycling participation rate soar. An ingenious design allows the handle to fold down and allows multiple bins to stack, one on top of another. Perfect for those environments where recyclables still need to be separated. You can create a "recycling tower" for glass, metal, aluminum, plastic, paper, plastic bags, Styrofoam™, batteries, etc. Made in North America with a minimum of 35% recycled content. Bin measures 13.5" tall (handle folded down), 10.5" wide and 14.25" deep. Measure carefully! Capacity is 6 gallons (assuming that it could hold water up to the top). Your order will contain three (3) identical recycling bins, shipped nested in one box. See our 4-pack, 6-pack, 8-pack, 9-pack, 12-pack, 16-pack and 23-pack listings for even greater savings per bin! please consider our 4-pack (a separate listing); for just $10 more than our 3-pack (this listing) you'll get a 4th bin; we can't tell you how many times our 3-pack customers contact us wanting to buy one more bin and buying a 4th now costs just ten bucks more and let's you take advantage of shipping economies; see our 6-pack ($11.16/bin), 8-pack ($10.60/bin), 12-pack ($10.29/bin) and 23-pack ($9.99/bin) for even greater savings! If you have any questions about this product by Recycling Rules, contact us by completing and submitting the form below. If you are looking for a specif part number, please include it with your message.